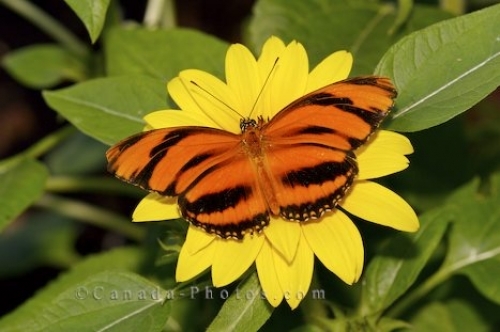 An orange and black colored tropical butterfly sits on a bright yellow flower in the Newfoundland Insectarium and Butterfly Pavilion in Newfoundland, Canada. Visitors walking the paths through the Newfoundland Insectarium and Butterfly Pavilion in Newfoundland, Canada, will find tropical butterflies fluttering about their heads. This radiant orange and black colored butterfly comes to feed on top of a bright yellow flower, covering the center where it retrieves its food. The newest addition to the Insectarium, the Butterfly Pavilion which opened in 2002, has over 500 tropical butterflies to be viewed in this indoor garden. This beautiful butterfly is just one species with many others being adorned in blue, red, orange, purple and green hues. All the tropical butterflies found in the pavilion are ensured of the ideal habitat with a mixture of flowers, plants and trees which they feed on. Picture of a tropical butterfly on a yellow flower in the Newfoundland Insectarium and Butterfly Pavilion in Newfoundland.